As we slip into soft, fluffy robes and rubber sandals, one of my two spa companions whispers that this will be her first massage. Ever. Oh my . . . what?! We are at the Willow Stream Spa at the Fairmont Scottsdale Princess, one of the top resort spas in Arizona, if not the United States. Given the location, she is probably about to have the best spa treatment of her life. "OK, I need to know," she leans in. "Will they see me naked?" I'm not sure if this is a good thing or a bad thing - on the one hand, it will be a great "first time." On the other hand, she is setting the bar pretty high. She may leave here believing that all massages come with an optional sage "smudging" ceremony to purify the space for healing, complimentary fresh-squeezed juices, change rooms outfitted with everything from plush towels to high-end toiletries, and treatment rooms that could be on the cover of Architectural Digest - not to mention some of the best practitioners in the industry. There is a reason so many people come to Arizona for spa treatments. There is a sense of wellness here, a sense of calm, that is worth seeking out. And Scottsdale has honed the spa treatment to a fine art. We make our way to the elegant waiting area, where three masseuses await. Two women, one man. His hands look like they could pound the knots out of a waterlogged rope. He steps forward for my friend. We whisper hushed farewells as we are ushered into separate treatment rooms - my "virgin" friend for a Desert Aromatherapy massage, my experienced friend (who makes regular pilgrimages to Arizona and this spa, in particular) for a Jet-Lag Recovery massage, and myself for the Desert Purification body treatment. I'm ready to relax and detoxify. My masseuse has the skilled hands of a much larger person, and quickly sets to putting my body into a state of relaxation. She applies a body mask of "native grains", a sticky mixture of cornmeal, oats, and clays (in keeping with the organic theme of these treatments, the mix is free of preservatives, artificial colourings or synthetic fragrances). The mask sits on my skin like a poultice, soothing and warm. The next step, having it exfoliated off with a natural-fibre cloth made from the Ayate cactus plant, feels wonderful. Almost as wonderful as the aromatherapy oil massage, featuring organic juniper, sage and rosemary essential oils, that follows. As my treatment winds up, I'm given the gift of my very own cactus loofah for exfoliation at home. Somehow, I know the ritual just won't be the same. Every element of this treatment is derived from the desert and Native American traditions. It's the kind of thing you would, quite literally, only find in the southwest, and one of the reasons so many people continue to flock to the desert for treatment. 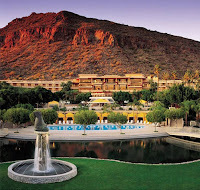 You could say that Scottsdale is known as something of a mecca for spa-goers. It's not just the use of adobe clay, pure aloe vera, ground jojoba seeds, sage and juniper, or Sonoran desert honey, though that is what gives Arizona spas their desert flavour. It's also the impeccable service and the spectacular settings - many of the best spas are destinations in themselves, from their desert oasis locations to their architecture and decor. There is also the matter of sheer volume. 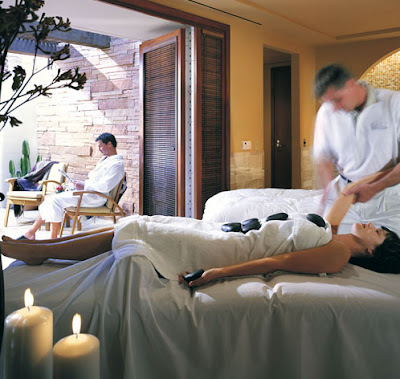 Scottsdale has more spas per capita than any U.S. city. With roughly 130 spas here, and a population of 232,000, it's clear this is an industry geared toward servicing those who flock to the desert for both body and soul. At the Fairmont Scottsdale Princess, the setting is spectacular; a 44,000 square-foot luxury spa that occupies its own wing of the elegant Fairmont resort, with many of the rooms open to nature - the sunny rooftop pool flanked by elegant cabanas, the glass-walled restaurant, the waterfall that connects all three levels of the facility. It's apparent from the many hushed, blissed-out patrons padding softly around, that the setting works to put you into a state of relaxation before desert-inspired treatments even begin. But desert-inspired means more than just using a cactus loofah. You can take it one step further - there's a spiritual element to the spa treatments here in Arizona. The Centre for Well-Being at The Phoenician, for example, offers private sessions in astrology, hypnotherapy and guided meditation. Eurasia Spa at Scottsdale Resort and Athletic Club starts every spa session with a Cosanti Bell ritual. At the Boulders Resort, the Golden Door Spa offers an experience called equilibrium bottle interpretation, designed to give you a picture of your true self. You can have your toes read at the Mandala Tea Room and Apothecary. There's something to all this good-for-the-soul stuff. When I finally emerge from my treatment, scrubbed, massaged, exfoliated and little lightheaded, clutching my very own cactus loofah, I wander out to the spa plunge pools. There lie my traveling companions, limp and smiling, one of them weeping quietly under a cool, cucumber-scented face cloth. "I am having a moment," comes her muffled voice. "I am just so, so happy right now." Now that's a spa experience.